Open-grown oak, native grasses, wild carrots, ox-eye daisies, and scattered weeds: July 3, 2005. 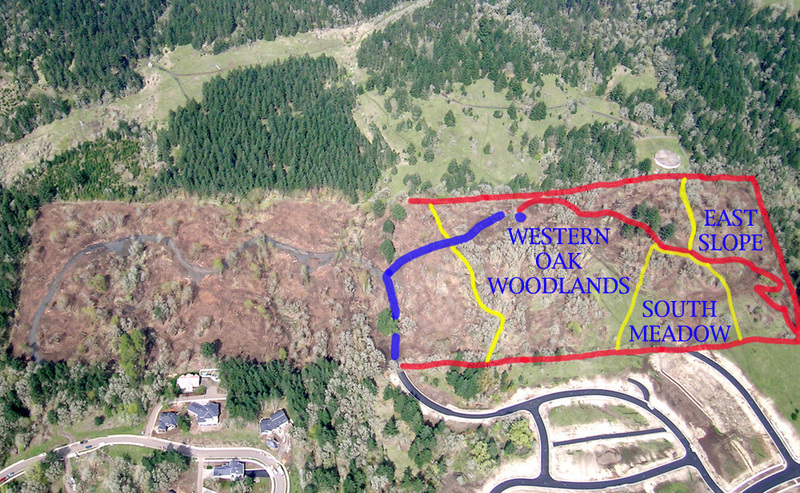 The initial 40-acre "Brandis Oaks Savannah Restoration Plan" draft was authorized by landowner Jack Brandis in late December, 2004, following several months of discussion and consideration, and beginning with the removal of most conifers from the property, as reported in the local press. The initial draft plan was written by Bob Zybach (as a consultant for NW Maps Co.) in a report dated April 1, 2005, and containing the nine goals and basic strategies outlined below. This original draft was prepared under the direction of Mr. Brandis and has been made available for local research and education uses with his full agreement and encouragement. This website is intended primarily as a tool for such purposes, and is focused on Benton County students, teachers, and researchers with an interest in the study of native oak savannah plants and animals. Website construction and maintenance costs have been provided by Oregon Websites and Watersheds Project, Inc. (ORWW), through the generosity of several local sponsors and collaborators. Primary editing and initial website design for this draft were completed by Brookman Holmes and Anthony Vaughan, Crescent Valley High School, on June 15, 2005. Bob Zybach and Josh Meredith (both representing ORWW as website editors, designers, and contributors) have continued to contribute to this website through July 15, 2005. Most recent work has involved translating the work of Holmes and Vaughan into standard ORWW Dreamweaver format files, and further testing and refining website texts, links, and content in the process. As a result of these changes, several portions of the original April 1 draft have been significantly modified (text formatting and links at minimum), or even eliminated (outdated maps or privileged information) for this website; other parts, partricularly appendices and technical information, have been expanded. Webpages using video or QTVR files, for example, have been mostly created by Meredith since June 15; largely as models that can be replicated by local High School students during the 2005-2006 school year. Project Goals. Nine project goals are oulined. Tasks and Timelines. Project restoration and maintenance tasks are described in terms of short-term (2 years), mid-term (2-10 years), and long-term (10-100 years) actions. Experimental Design. Two formal experiments are proposed and a series of questions posed to students and researchers that have application to the restoration and maintenance of oak savannah environments. Project Measures. A number of measures are suggested by which progress and other trends related to project success can be evaluated. There are two basic approaches to the project, but a guiding purpose for both approaches is to provide needed long-term habitat for a number of listed “"Sensitive,"” “"Threatened,"” or “"Endangered"”plant and animal species: specifically, Kincaid's lupine, Fender's blue butterfly, western bluebirds, western gray squirrels, and sharp-tailed snakes (see Plant and Animal webpages). The plan is intended to be dynamic and organic, and to be transferrable to future landowners, students, teachers, researchers, and resource managers, so long as its primary goals remain in effect. The project site is located along the northern city limits of Corvallis, Benton County, Oregon, within the current Urban Growth Boundary (see Maps & GIS). The western 22 acre portion of the project is intended to be a low-density residential development maintained through private ownership agreements, and the eastern 18 acres is intended to be maintained as an oak savannah environment through a long-term program of formal education-, training-, and research-based activities. Both sides of the property will be landscaped with native vegetation for the purpose of providing food and shelter for the four named animal species. Other reasons for using native vegetation include aesthetics, wildfire control, and significant landscape maintenance savings in fuel and water. The plan consists of five basic parts: 1) stated project goals and objectives, 2) a chronological series of tasks and strategies designed to achieve the stated goals, 3) the performance of two stand-scale experiments and several informal experiments to help guide future management actions, 4) a number of measures that can be used to evaluate experimental findings and help determine whether--and to what degree--strategies and tasks are effective, and 5) a series of referenced appendices and supplemental reports. The following nine goals were developed under the direction (or agreement) of Jack Brandis, who commissioned this plan. Key consultants included John Brandis III, John Stewart, John Thomas, Wayne Giesy, Lynda Boyer, Phil Hays, and Rod Slattum. These same individuals also had significant input in developing the tasks and research questions outlined on the following pages. Goal 1. Habitat Restoration and long-term maintenance of oak savannah and woodland conditions throughout the project area. Goal 2. Wildlife Establishment and long-term maintenance of populations (or habitat) of Kincaid's lupine, Fender's blue butterfly, sharp-tailed snakes, western gray squirrels, and western bluebirds. Goal 3. Residential Development of approximately 22 western acres into homesites and streets landscaped with native vegetation, in general accordance with goals 1 and 2, and for water and fuel conservation purposes. Goal 4. Savannah Long-term maintenance of approximately 18 eastern acres as oak savannah habitat with a focus on the species listed in Goal 2, and for purposes of public recreation, education, and research. Goal 5. Trails Construction and maintenance of a public trail segment through the oak savannah habitat that connects Corvallis City Parks on the east boundary to OSU Research Forests to the north. Goal 6. Weeds Control of existence or spread of exotic plants and weeds within the project area, with a focus on conifers, Brachypodium (false brome), and poisonoak. Goal 7. Wildfire Significant short-term and long-term reductions of fuel loads between Corvallis City limits to the south and OSU Research Forests to the north, for purposes of reducing wildfire risk. Goal 8. Burning Reintroduction of Indian-type burning methods on an experimental basis (training and research) for short- and mid-term maintenance of oak savannah habitat, and for addressing goals 1, 2, 4, 6, and 7. Goal 9. Funding Identification of potential funding sources for achieving goals 1, 2, 4, 6, 7, and 8. The following chronology lists the principal tasks that have been completed or that are planned to be completed in order to achieve project goals. 2005 Complete transformation from conifer forest to oak woodland. Winter Removed conifer overstory (Goals 1, 2, 3, 4, 6, 7, and 8); thinned and weeded designated leave trees, piled slash, planted bulbs, seeded bare soil, initiated native species inventory (Goals 1, 2, 4, and 6); conducted surface CRI (Cultural Resources Inventory) along cutbanks, skid trails, and throughout work areas, rocked roads, and roughed in trail (Goals 3, 4, 5, 7, and 8); removed ladder fuels and basal fuels from leave trees and hand piled or scattered outside driplines (Goals 6, 7, and 8); initiated contact and discussions with appropriate schools and government agencies regarding potential funding for future site use and maintenance (Goals 2, 4, 8, and 9). Spring Map and document native plant and animal species (Goals 1, 2, and 6); CRI; spot spray weed species (Goal 6); harvest windfall (Goal 7). Summer Spray; harvest native seeds; burn south meadow (Goal 8); CRI. Fall Spray; inventory; spread gathered seed; spread plastic pile covers. 2006 Complete site-prep, weeding, initial seeding and planting. Winter Burn piles; rake ashes; CRI; seed and plant bare areas. Spring Spray; harvest windfall; [establish experimental plantations?]. Summer Spray; inventory; gather seeds. 2007-2014 Establish Kincaid's lupine & Indian-type burning experiments. Winter Plant trees and shrubs; prune; weed; harvest windfall. Spring Weed; plant inventory; harvest windfall, berries, bulbs. Summer Burn (Goal 8); CRI; plant inventory; harvest bulbs, seeds. Fall Burn (Goal 7); CRI; plant inventory; harvest nuts, bulbs, seeds. Allow old-growth savannah conditions to develop through attrition. A loss of nearly all trees is acceptable, so long as target species (Goal 2) continue to persist, at least a few each of oak, Douglas-fir, and madrone exist in good health, and native shrubs, bulbs, forbs, and grasses form the understory. The following questions and experiments--intended for student and teacher interactions with local social scientists, ecologists, botanists, wildlife scientists, resource managers, and technical experts--assume that this plan will proceed as outlined. 1) Can urban residential developments coexist over time with scarce or endangered plant and animal species? 2) Can scarce native animal populations be stabilized or increased in small (less than 20 acre) urban islands of native habitat over time? 3) What are the short- and mid-term effects of different regular burning schedules on native upland prairie and woodland plant assemblages? 4) What is the short-term effect of different regular burning schedules on targeted native and exotic weed populations? 5) Can an endangered species (Kincaid's lupine) be successfully transplanted into a similar environment in close proximity to its historical populations? If so, will it attract (expand the range of) nearby Fender's blue butterflies? 6) How will wind damage affect shape and mortality of released oaks and other hardwood trees? How do bluebirds and gray squirrels use these trees? The following measures exist principally as recommendations and suggestions. The use of measures is critical in guiding this project through time. [A more detailed description of proposed measures can be found at this link]. 1) Abundance (or absence) of target and focus species. Target species are Kincaid's lupine, Fender's blue butterfly, western gray squirrel, western bluebird, and sharp-tailed snake (see Goal 2). An ideal would be to have experts train students in the techniques of identifying, numbering, and mapping the various target and focus species through time. 2) Aesthetics. What constitutes "an oak savannah condition" at any point in time? What are seasonal differences, and what differences develop over time? Digital photography is a (recently) cheap and effective way to capture visual differences in the environment. 3) Educational uses. Measures could be student reports, student visitor hours, number of research projects, number of website visitors (general information), and formal users (tuition fees). 4) Maintenance expense. Is an oak savannah more expensive to maintain than a Douglas-fir plantation? Do native street trees, shrubs, and flowers save significant amounts of mowing, pruning, spraying, and/or watering costs? 5) Public safety: wildfire and windfall. The removal of conifer trees significantly reduces the potential likelihood and severity of wildfires; an important consideration of forested "urban-interface" lands. 6) Scientific findings. A wide variety of very useful scientific data will be accumulated if this plan is followed to completion. Measures are journal articles, website reports, changed management plans, and summaries of other measures. 7) Training days. How many Corvallis firefighters learn or practice field burning at the site? How about GIS or GPS training? Website design? 8) Visitor days. These are mostly academic questions, but they have a lot to do with the contributions the property will make to the quality of life for local students, residents, and others who visit the site through time. 9) Water use. Native plants are, naturally, drought resistant and generally require very little--if any--irrigation. 10) Website utility. A formal website based on research and management findings associated with the oak savannah could be the basis for public education and formal academic curricula plans. © 2005 by Oregon Websites and Watersheds Project, Inc. and NW Maps Co.